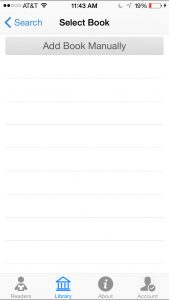 When you first start the iPhone App, you should see this welcome screen.Tap “SIGN IN” to begin. 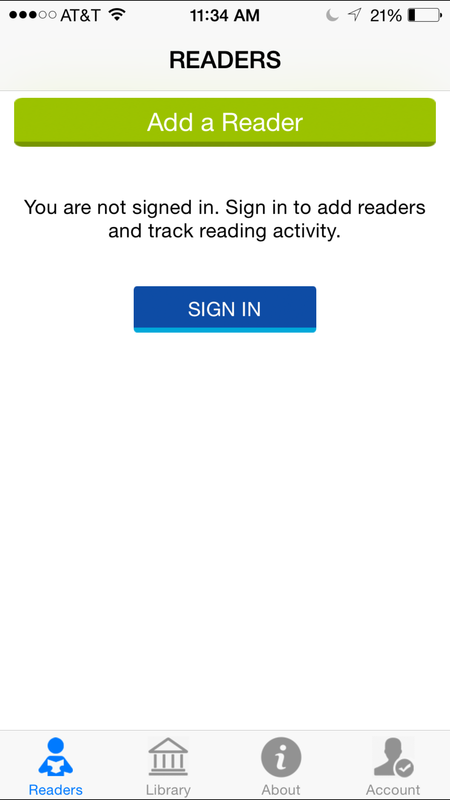 If you tapped “SIGN UP” you will then be taken to the registration screen. Enter the requested information and then tap “SIGN UP” to complete the registration.Please make sure you fill out the information correctly or you may be unable to retrieve your account information. 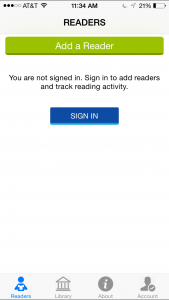 The first thing that you should do is “Add a Reader”. You can add multiple readers and track their progress separately. After tapping “Add a Reader” you will be prompted to enter the name of the reader.If you tap the image of the person, you can choose to use a photograph as a custom icon. 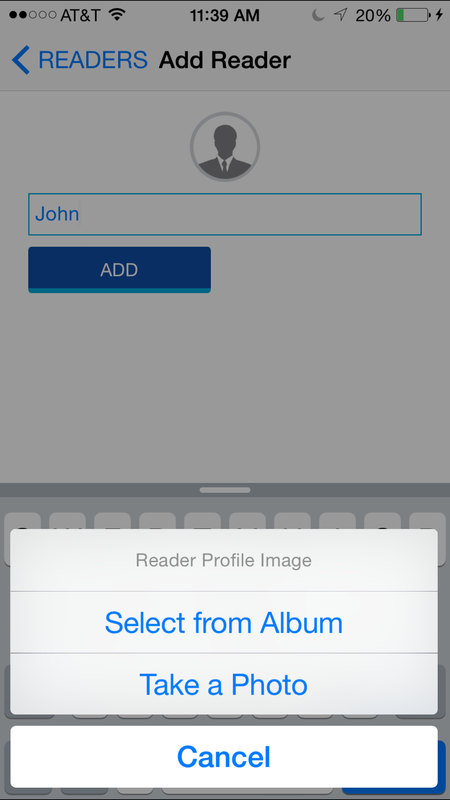 You are given the option of either selecting from your photo album or taking a new picture. 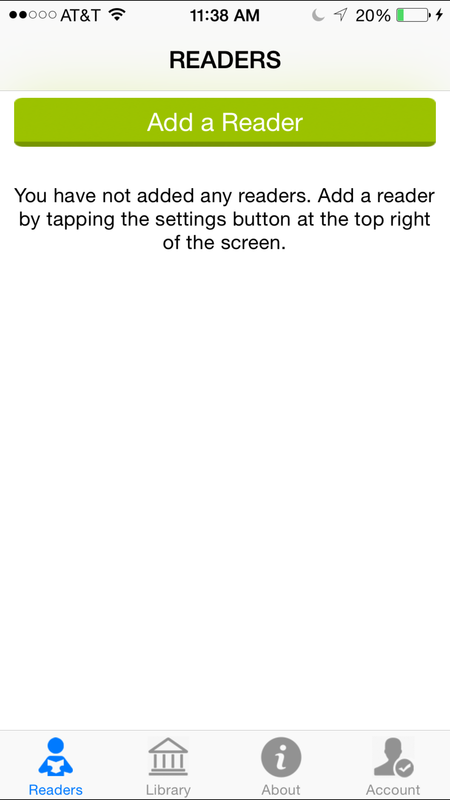 Please then tap the “ADD” button to add the reader. 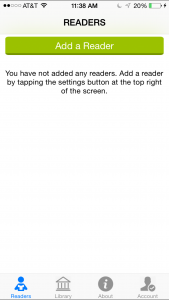 You will receive a notification that the reader has been successfully added. 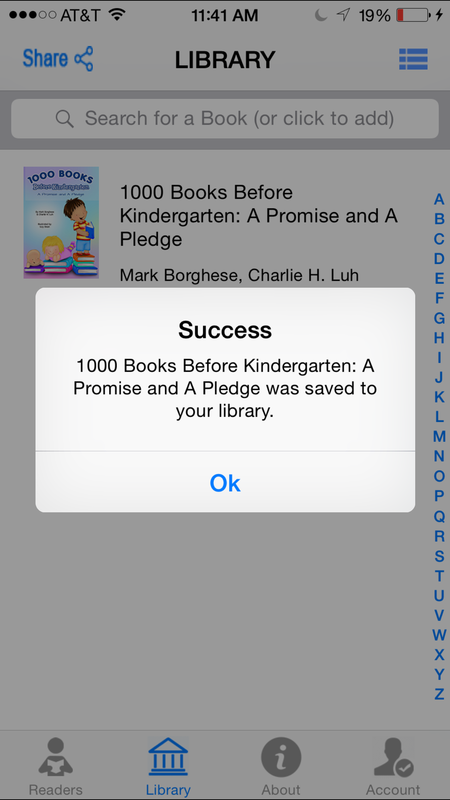 The next step is to begin building your “LIBRARY” of books. When you tap on the “LIBRARY” tab at the bottom, you will be prompted to “ADD BOOK”.You primarily have three ways to “Add a Book”. 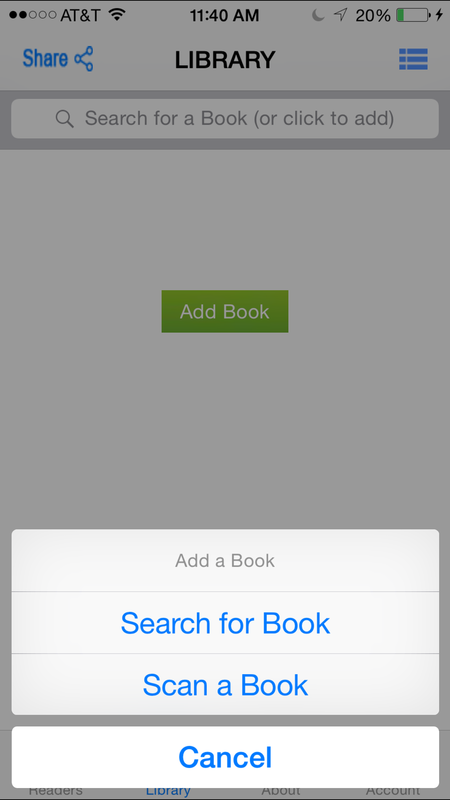 The first way is to “Search for Book”. 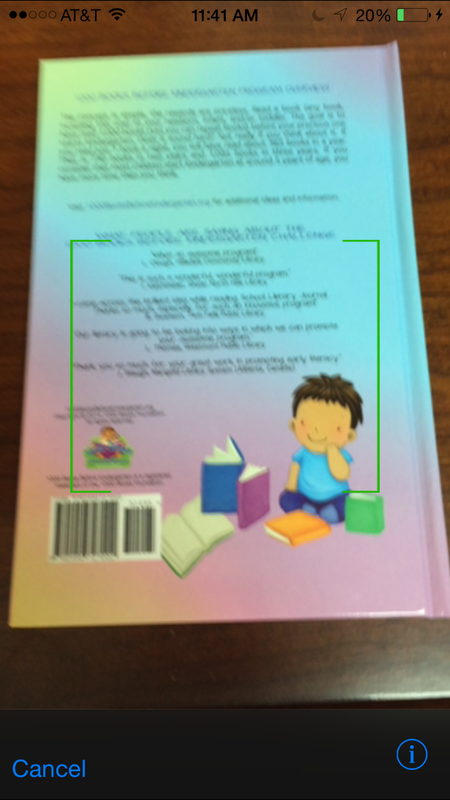 The second way is to “Scan a Book”. 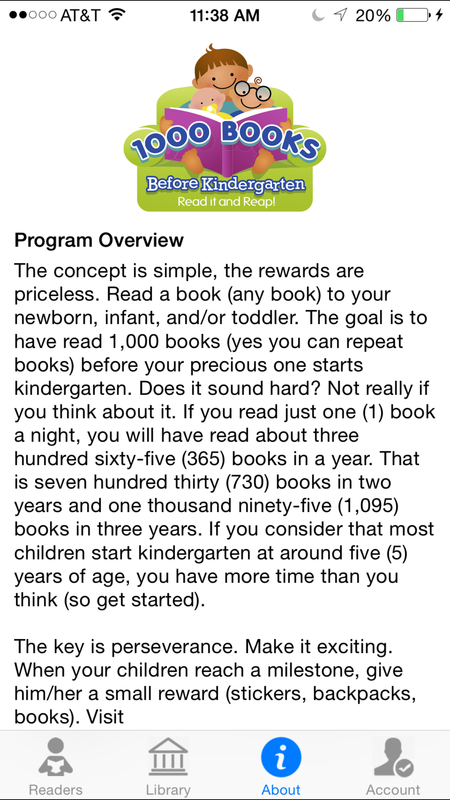 The third way is to “Manually Add a Book”. Let’s start with “Search for Book”. 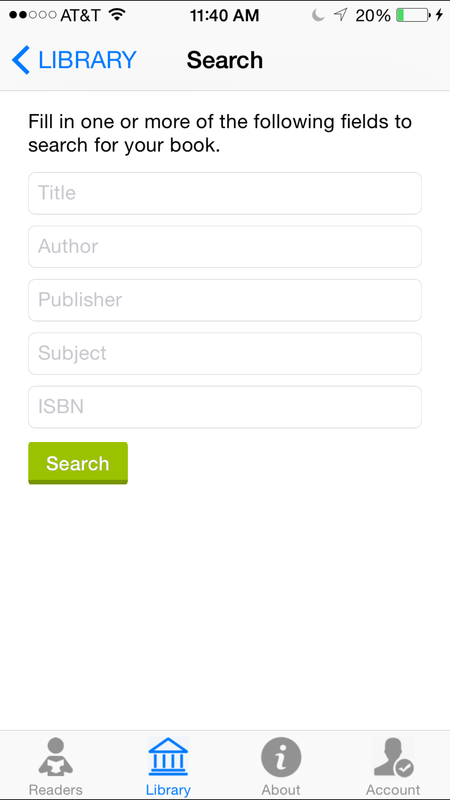 It is recommended that you search using the “ISBN” field. 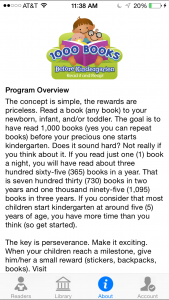 Please note that a book can have multiple and different ISBN numbers. 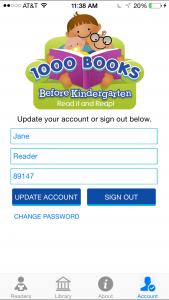 However, each ISBN number should be associated with only one book. “Scan a Book”If you have a copy of the book handy, try using the “Scan a Book” feature. 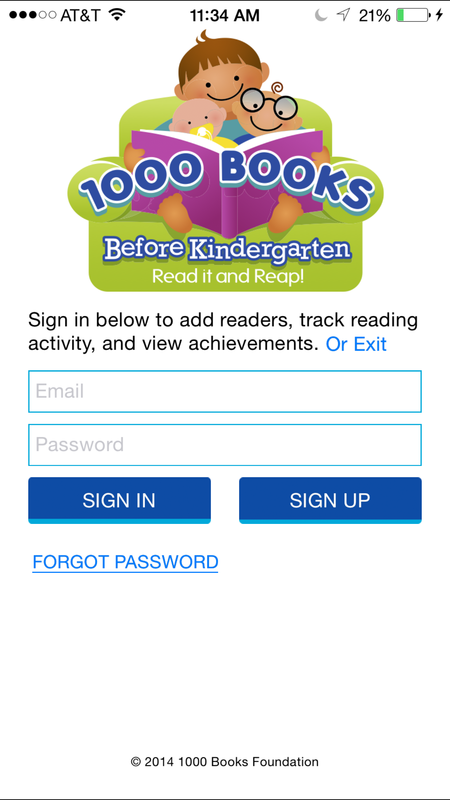 When you use this feature, the 1000 Books Before Kindergarten App will then access your camera. 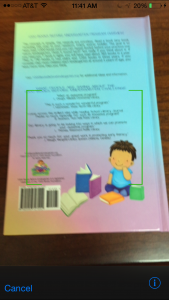 Simply move the green scanning box over the ISBN barcode to retrieve the book details. 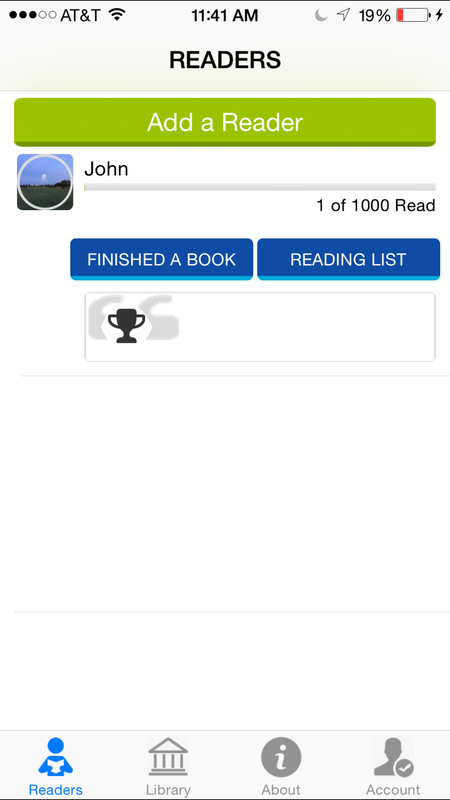 The App will then read the ISBN barcode and search the Google Books database to retrieve the book details. Please note: not all books are contained in the Google Books database and some book details may be incorrect or incomplete. 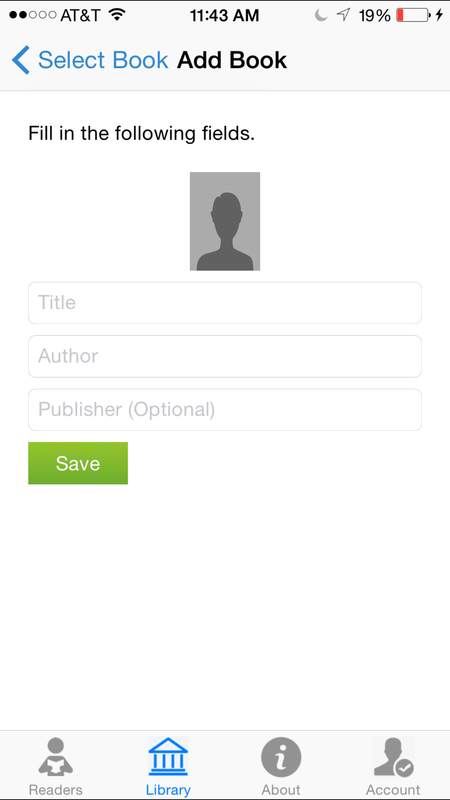 For example, it may display “Anonymous” as the Author, or the cover image of the book cannot be retrieved. 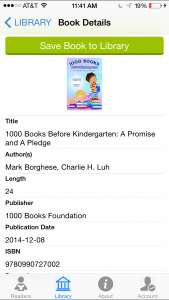 If you notice problems with the books that you have added, simply email book@1000BooksFoundation.org and we will work our best to get the correct book details entered. 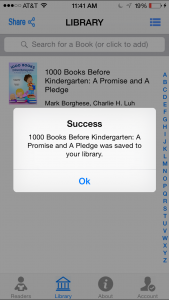 If the book is found in the database, an image of the book and details of the book details will be displayed.You will then be prompted to “Save Book to Library”. 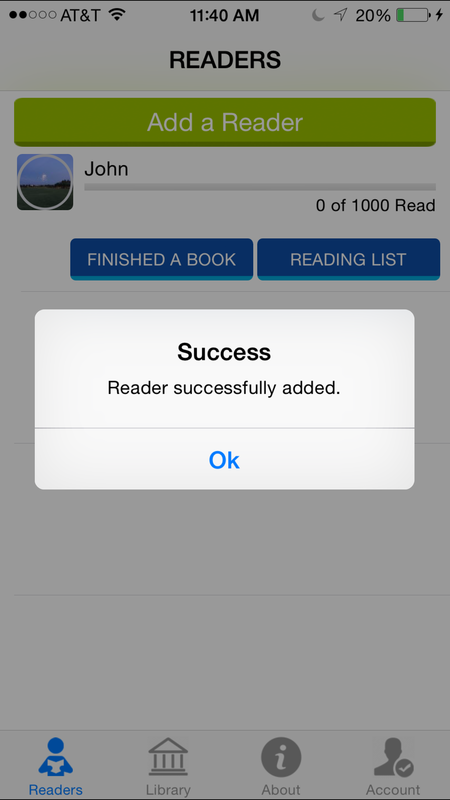 You will receive this “Success” message when the book is successfully added to your database. 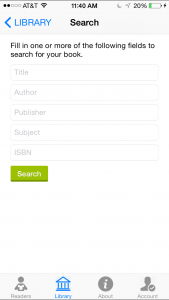 If you cannot locate a book through the Search and/or Scan feature, you can always add the book manually.To access the “Add Book Manually” tab, simply go to Add New Book/Search for Book/Search (leaving all the fields empty). 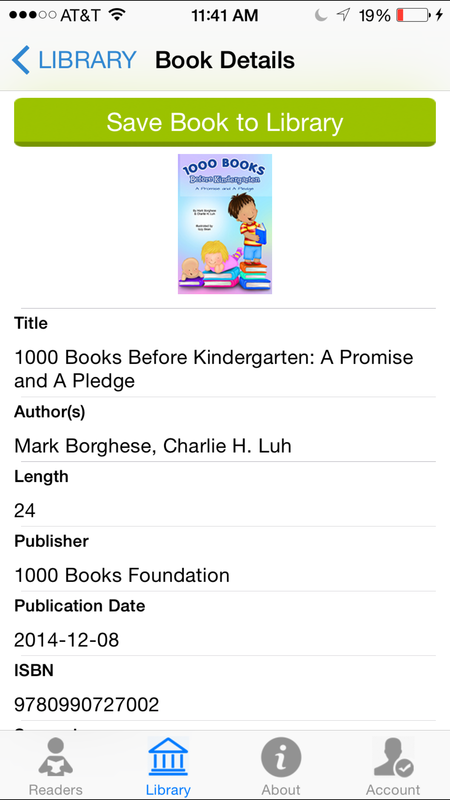 You will then be prompted to add the Title, Author, and Publisher (optional) information for the book.You can also take a picture of the book by tapping the picture icon. 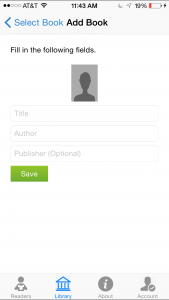 After you enter the details and add the picture, simply tap “Save”. 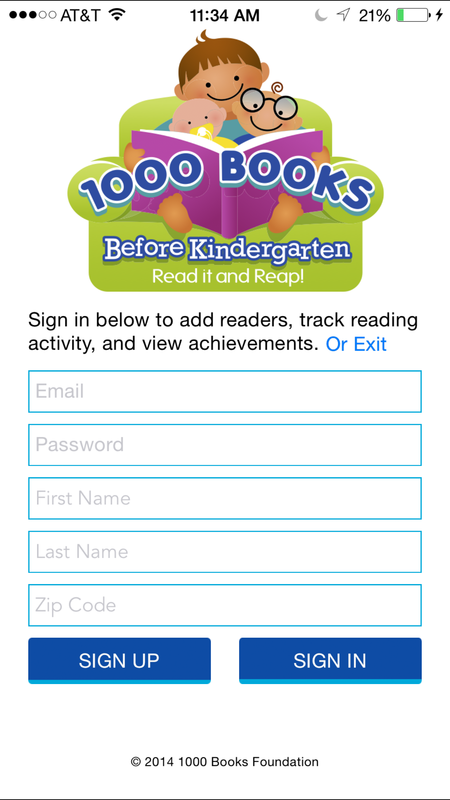 From the “READERS” tab, you can add books that you have read to your child and/or check your child’s reading list.When you tap “FINISHED A BOOK”, your library will be brought up. 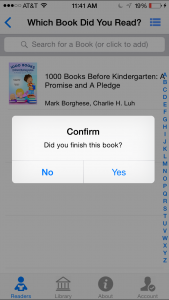 Simply tap the book that you read and you will be prompted to confirm whether you read this book to your child. If you tap “Yes”, the book will then be added to your child’s reading list. The book counter will then increase. 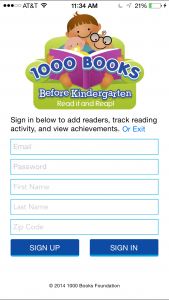 “About”This tab will display information about the 1000 Books Before Kindergarten Challenge. “Account”This tab will bring up information about your account. Please email:contact@1000BooksFoundation.org with any further questions about the iPhone and/or Android App.